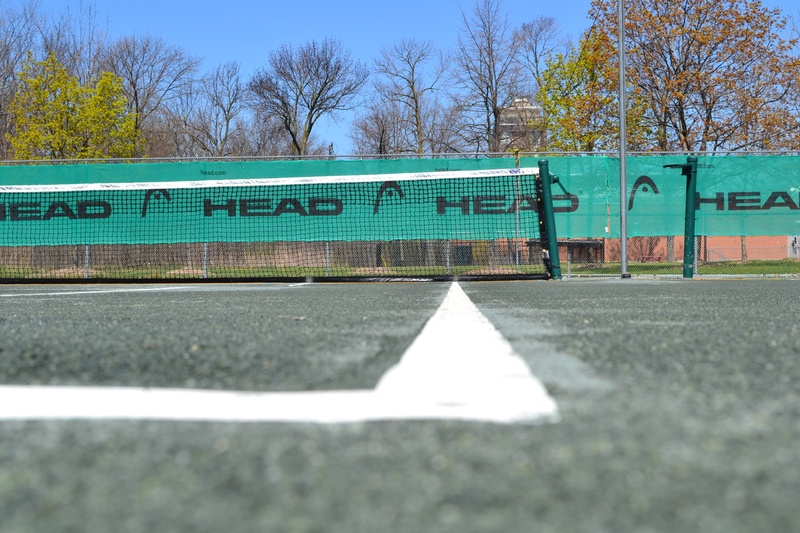 Play on the courts is for members and their guests only. All players must wear suitable athletic clothing for tennis on the courts at all times, including shoes that will not damage the clay court surface. The club is open for play between 8:30 am until 11.00 pm, weather and court conditions permitting. Last court booking 10:00 pm, court maintenance must be completed and lights must be off at 11:00pm. If there is no one is using the courts after 9:30 pm the club may close earlier. All members should use their nametag on the booking board before going on to the courts. Members must be on the premises (and remain on the premises) to tag up. Remember the courts are numbered from South to North. Courts 1, 2 and 3 are closest to the Queensway, courts 4 thru 6 are closest to the clubhouse on the South side. Courts 7 and 8 are north of the clubhouse. Court 7 (and sometimes court 8 as well) will usually be reserved for the Club professional for lesson and clinics. Tags for all players on a court should be used in the time slot. If players wish to book for an additional time slot they should only retag at the end of their time slot. Every attempt will be made to tag courts reserved for programs and for maintenance on the board and to run programs in court times that coincide with court booking periods. NEW for 2019!!!!! This year we are introducing ONLINE BOOKING during prime time, meaning evening play on weekdays and morning play on weekends. That means that during Prime Time, you will be able to book your court from home on your mobile device or computer. You will also be able to book your court from the computer at the club as well. We are hoping to make the transition to only online booking by 2020. Courts are closed at certain times during the day, in rotation, for maintenance and watering. The club manager will book the courts for maintenance on the booking board. Please vacate the court at the end of your booking time and do not go onto courts during maintenance times. Please always sweep the entire court after play. Make sure you sweep the area between the fence and the base line as well as the areas that haves been disturbed between the courts. Court sweeping is done at the end of your time slot. If the people following you do not wish their court to be swept, you do not have to do it. However, if they want the court swept it will be done within their time slot. It does not matter if you sweep up and down, from side to side or in circles. Guests should be signed in by the sponsoring member and their fee paid before playing. Guest fees are $10 regular day rate for adults, $5 for juniors. A reduced guest fee of $5 is given for guests attending socials. The same individual may be a guest a maximum of 5 times a season. A member may bring a maximum of 3 guests per day. Special arrangements for short term memberships can be made for out of town guests. For example a 7 day pass for $60 is available for guests who live more than 100Km or more from Credit Valley TC. There will be a free guest week at the start of the season. The club is fortunate to have change rooms and a kitchen. The club has washrooms on the main floor and change rooms are in the basement of the clubhouse, which is entered by steps outside the south end of the clubhouse. The clubhouse has a kitchen, which includes a fridge, kettle and a number of teapots, mugs, plates, cutlery, serving dishes etc. Members may use the kitchen facilities provided they leave the kitchen in good order (as they found it or better) with dishes clean, garbage/recycle in proper bins etc. Except by arrangement with the manager (for match or event food preparation), please do not leave any food in the clubhouse fridge or it will be disposed of promptly. The club is run on a voluntary basis. In the unlikely situation where a player is misusing the facilities or violating club rules, members should politely ask the individual(s) to desist. In the case of any rule dispute the Club Manager’s decision is final.